Choose from the full range of lodgings available in Siena and the surrounding area Reservation Services Siena. The best solution to suit your needs: Hotels, Farms & Country Houses, Historic Residences, Bed & Breakfasts, Hostels, Religious Boarding Houses, Campings, Camper Motorhome. Ready to hit the racks, but don't know which neighborhoods are prime Shopping destinations ? Our editors identify Shopping hot spots in Siena and Tuscany - Italy. Consult our Typical Products section to find out where to get the area's best local produce and make the most of it in your kitchen at home. You can find Wine-Cellars that offer Wine tasting & Wine tour and Oil-Mills that offer Oil tasting. 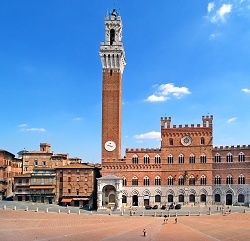 Looking for a great way to spend time in Siena? Take a look at our Activities Packages section to find out what extra amusements the city and the surrounding area can offer. Get the inside scoop on the full variety of cuisine available in Siena and the surrounding area, from the best local specialities to top international cuisine or just a simple pizza in the Restaurants, Pizzerie, and Restaurants, Pizzerie, and Pubs section. Undoubtedly one of the best known traditional folkloristic events in the world, the Palio of Siena is a religious festival as well as a secular celebration. The Palio of Siena takes place twice a year, on July 2nd and August 16th. On very special occasions a third Palio is held, termed straordinario, the first of which took place on June 2nd 1861 to celebrate the newly proclaimed unified Kingdom of Italy. Any visitor to Piazza del Campo during the days preceding a Palio will see the square completely transformed. The entire square is paved with blocks of tufa rock and the track around which the Palio is run is covered with brown earth. Wooden stalls are arranged around the square to seat the authorities and those who have walked in the ceremonial processions. The centre of the square is fenced in to contain the vast crowd that assembles to watch the race. Just as Siena is built on three hills of tufaceous rock, it’s urban layout is divided by three main streets. The city’s main crossroads was once known as the triventum, along the Via Francigena, with the Croce del Travaglio marking the intersection between Banchi di Sotto, Banchi di Sopra and Via di Città. The fulcrum of everyday town life in Siena is Piazza Croce del Travaglio, whose name could derive either from the Medieval practice of erecting barricades made out of beams whenever there was fighting among the city’s factions or from a cross that once stood here pointing the way for pilgrims along the Via Francigena and towards the Spedale di Santa Maria della Scala. From Piazza del Campo, considered neutral ground by the inhabitants of Siena on account of its location directly between the three hills on which the city stands, Vicolo San Pietro to the right of Fonte Gaia leads to the Croce del Travaglio, the arrival point of the three main streets of Siena: Via Banchi di Sopra, Via Banchi di Sotto and Via di Città. As well as being the emblem of Siena, the shell-shaped Piazza del Campo is one of the world’s finest Medieval squares. The square features two sharp curves joined by a straight line of buildings. SAN GIMIGNANO - With its unmistakable towers that make it easy to spot even from a long way off, the town of San Gimignano has remained virtually intact over the centuries and offers a fascinating insight into what life was in this area in the 13th century. 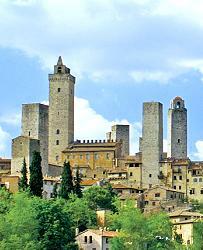 San Gimignano and the surrounding area are also well known for their excellent cuisine and for produce such as cured meats, vegetables preserved under oil, and wine. Wedding in Tuscany - Siena area wedding. The most important day of your life is coming up. You may well have been dreaming of how it could be in the nature, hills or with a beautiful Tuscany sunset in the background. The fascinating area of Tuscany known as Val d’Orcia is a land rich in flavours and colours. Frequently painted by artists of the Senese School during the Renaissance, the Val d’Orcia has been a favourite haunt for European travellers through the centuries and has been described in the works of many Italian and international writers.